Patients with equal objective leg length discrepancy (LLD) may have different subjective perceptions of this condition. Our aim was to analyze the effects of gender, age, operated side, surgical approach, body height, body mass index (BMI) and LLD measurements on self-perceived LLD after total hip arthroplasty (THA). 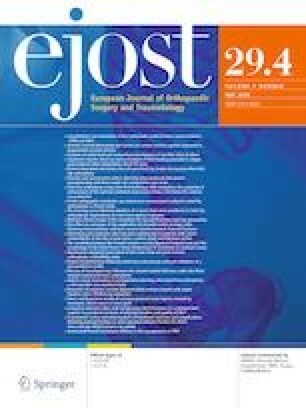 Observational cohort study with minimum 5-year follow-up included 159 patients with unilateral primary THA at a single institution, who reported subjective feeling of equal or unequal leg lengths after THA. Gender, age, body height, BMI, surgical approach, preoperative and postoperative absolute/relative/pelvic radiographic LLD measurements were included in direct comparison between groups and multivariate analyses with self-perceived LLD as the outcome variable. Out of 159 participants, 39% subjectively perceived postoperative LLD, while others reported equal leg lengths. The two groups postoperatively differed in the median relative LLD (10 mm vs. 5 mm; p = 0.01) and WOMAC (230 mm vs. 110 mm; p < 0.01), but not in the pelvic radiographic LLD. After adjustment for gender, age, operated side and surgical approach, postoperative relative LLD (odds ratio 1.38 for each 5 mm increment; 95% CI 1.01–1.74) and combination of BMI < 26 kg/m2 and body height < 1.75 m (odds ratio 2.49; 95% CI 1.14–5.41) were independent risk factors for self-perceived LLD. Clinical relative LLD measurements are better predictors of self-perceived postoperative LLD than pelvic radiographic measurements. Patients with smaller body dimensions will more likely report subjective leg length inequality at a given objective LLD, regardless of gender or age. We thank Dr. Peter Brumat and Dr. Matej Keršič for their help with data acquisition and radiographic analyses. The authors declare no conflict of interest with respect to this study. The study protocol was reviewed and approved by the National Medical Ethics Committee of the Republic of Slovenia on August 19, 2014, case No.# 97/08/14. Informed consent was obtained from all individual participants included in the study who provided prospectively collected data.